Picture from padodes : The head on a frothy pint? Picture: The head on a frothy pint? 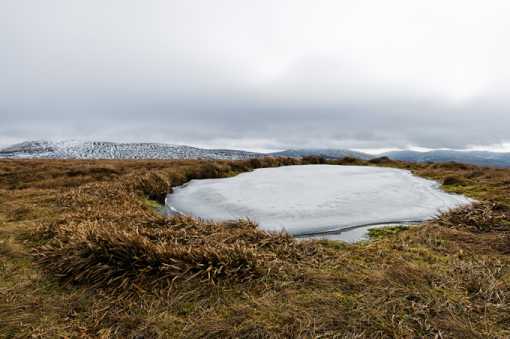 On a recent visit to Moanbane, I found the little pond on top had frozen over and the lingering snow that had fallen on it had risen into a puffy meringue or soufflé, or a bowl of whipped cream, or the head of a frothy pint – wherever your taste buds take you (see photo, with snow-ribbed Mullaghcleevaun in the left background). The name Moanbane (Móin Bhán: white bog) must surely be derived from the carpet of bog cotton (cottongrass) that covers this and the surrounding hills in early summer. 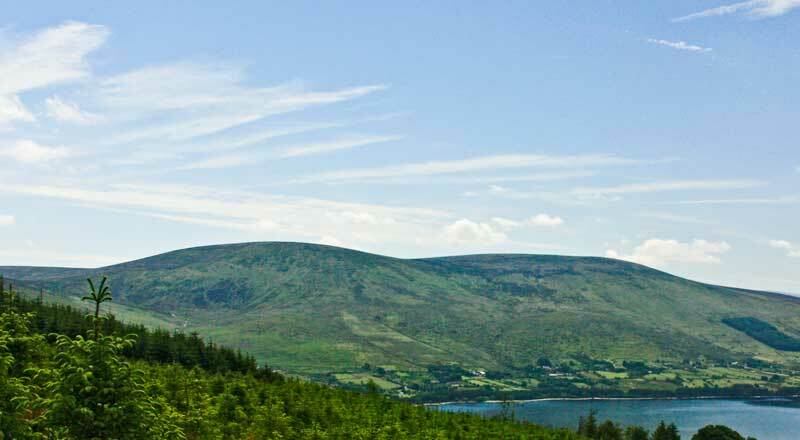 Seen from the far side of Blessington Lake in that season, the domes of Silsean (another luminous name), Moanbane and even unpromising Black Hill can look snow-white in the sunshine. From Silsean its a short hop accross to Moanbane. There is evidence of quadbike/scrambler activity in the area. The going can be very soft in places and in particular in the saddle between Silsean and Moanbane where there is a virtual marsh to cross. The reascent to Moanbane from Silsean is not taxing in the slightest and along the way great views accross Blessington and the reservoirs are on offer. As discussed previously on this website there is no clear summit cairn or marker but judging by GPS readings the little pond is indeed the most likely candidate. This pond is not marked on sheet 56. Mullaghcleevaun can be tackled from Moanbane but I had other summits in mind to bag and decided to return to the car. From Moanbane I took a bearing for one of the streams feeding into the Ballinagee River. The descent from Moanbane to the head of the stream is not as knree jerking as it may appear. When I reached the location of the stream it was infact dried up but the river bed was clearly visible and I simply follwed this down to the where it forks with the Ballinagee River itself at O045053 D. I came upon two seperate large herds of deer (perhaps 13-16 deer in each) as I approached the fork in the river, and judging by their reactions they are not used to seeing people pass this way. The valley below Billy Byrnes Gap is in itself a fine palce to be, and I decided to take lunch at the river side. Small pool at the top. 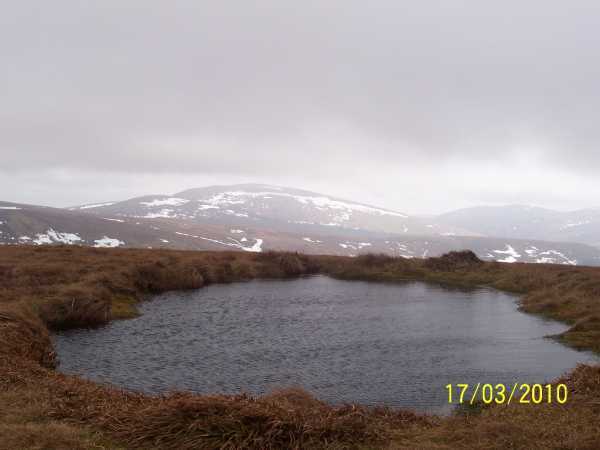 Picture from kaybee : Pool on Moanbane summit, Mullaghcleevaun in the background. 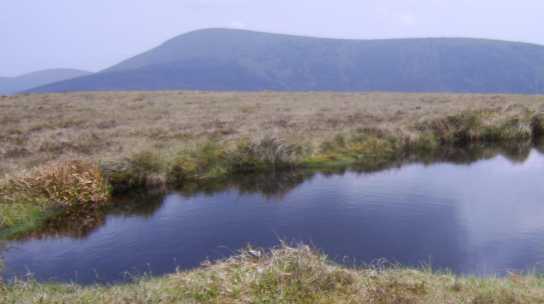 Picture: Pool on Moanbane summit, Mullaghcleevaun in the background. Picture from simon3 : Moanbane pond. There's no distinct top but, as csd says, it seems to be somewhere near this pond. I was up here on a fine summer day to find dragonflies cavorting. Not so the cold windy January day of this picture. 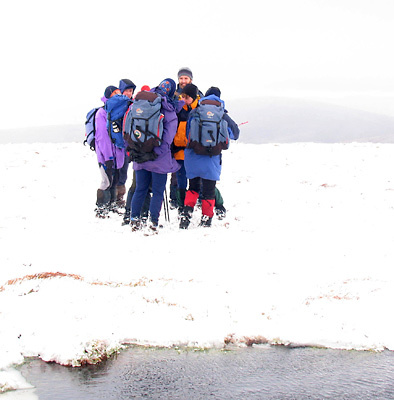 The group were huddled together for warmth, just willing me to finish fiddling with the camera.